Lacy Cooke is a writer and journalist. Her work has appeared in ThriveWire and OnFaith, among others. She's a California native transplanted to Connecticut where she lives with her husband and cat. She tweets and pins @lacygcooke. I had in mind a book that was going to sit on a shelf, lie playing dead across the shelf and depress you for failing it. A wonderful reminder of the value of the humanities, particularly given the climate in the US at the moment and the always-troubling, deep strain of anti-intellectualism that runs through our national fiber. Mario Vargas Llosa (Author), Natasha Wimmer (Translator). 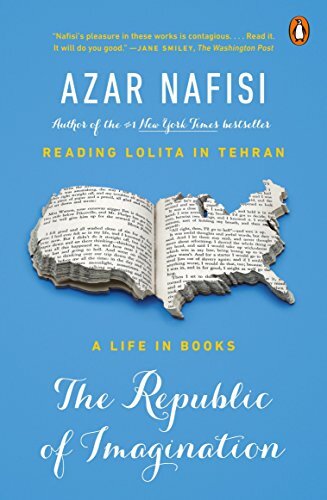 Nafisi is one of great voices for traditional liberalism. Exposing America’s current situation as one of a “reign of ignorance” and “gross materialism” is dead on accurate. She doesn’t kowtow to the ideologies of the identity politics crowd — that astute observation about James Baldwin in a time when he is namedropped far too often and without any real understanding is evidence of this — and that couldn’t be more refreshing. This isn’t a whiner, grousing and griping about white privilege or male privilege or any of that nonsense. She knows and has seen real oppression and real sexism and combats it simply through her intelligence and measured reason. One of our true living literary heroes. Hmm. I question if Nafisi would be so quick to a.) label as “nonsense” the perspectives and life experiences of others (here in 2015 America) and pigeonhole them “whiners” who “grouse” and “gripe,” or b.) to exercise the omniscient power of identifying the relative “realness” of oppression and sexism according to her own personal measuring stick. “Understand, not judge”. What a lovely sentiment from Ms. Nafisi, showing me that intellect and kindness must always go hand in hand. Wonderful interview Ms. Cooke; I have saved it to read again and savour. Bravo! Excellent piece on what it is to be truly liberal in one’s thinking — that you might have to take chances and be confused and not have a neat, unambiguous answer for every contingency. This is a huge wake up call for all of us — the right and the left — complacency and conformity are not democracy in action. She cuts right to it . And her reading of so many seminal American writers we think we know is practically revolutionary. I will be rereading this and looking for all her books. Thank you for this. Holy “Fallacy of Relative Privation” Batman! Following up on my comment of October 29, 2015 in response to the above, last night, I was dumbstruck to listen to a tape of a very unpleasant fellow screaming incoherently and abusively in the public courtyard of the University of Missouri, clearly chuffed by the protesters at the school who that very day effected the resignation of the University president. The ranter dismissed the hunger strike of Missouri grad student and protest activist Jonathan Butler by literally comparing his hunger to the hunger felt by famine victims in Africa. Thus, our screaming fellow, tho a confused sort, and, very likely unknowingly, PERFECTLY applied the “Fallacy of Relative Privation” in the most literal way imaginable. A true savant. Sometimes, satire has to bow to the force of inspired idiocy, whether in a Presidential candidate with atrocious hair, or a man yelling in a University Square.